nCred is excited to launch a new client portal that will improve the ease of access to credentialing information for healthcare organizations to better oversee the credentialing process for its providers. The new nCred client portal is intuitive and offers quick access to all provider credentialing information, status reports, and stored documents. 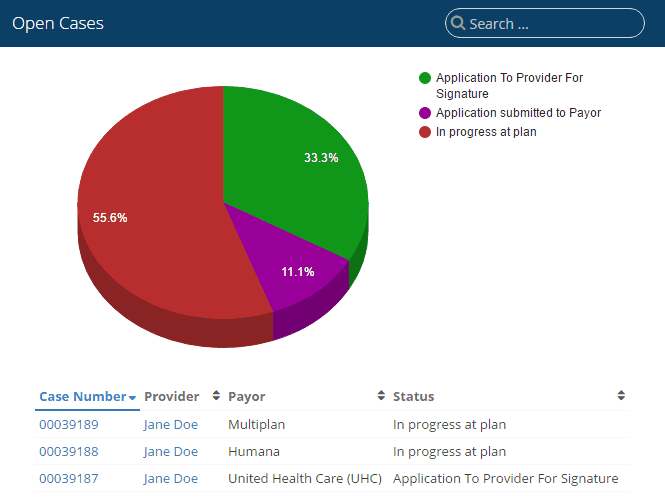 The new nCred dashboard lets users see at a quick glance the status of important areas of credentialing with detailed data only one click away. Monitor the turnaround time of your provider enrollment applications as well as what items are missing to complete a credentialing process. Our online tools help any organization better manage the important revenue cycle function of payor credentialing. nCred’s cloud based platform offers best of class service and processing time for its credentialing clients. The new client portal is further commitment to our philosophy of combining leading technology with experienced staff members to provide industry leading services. With nCred, your provider files become easier to manage and navigate! Forget paper files or outdated software applications, the new nCred portal takes the hassle out of maintaining current credentialing files. Keep all your provider files in one central location with ease of access through our secure portal. Share access to your credentialing records throughout your organization as needed to improve internal efficiency. Interested in seeing a live demonstration of the new nCred portal? Give us a call today at (423) 443-4525 option # 1 to discuss how our credentialing services can assist your organization and to arrange for a demonstration of our client portal. Or complete our request for proposal here and a representative will reach out to you to discuss our services. nCred is a national leader in credentialing services. We work with healthcare organizations to assist with the payor provider enrollment process and also providing primary source verification of credentials. Our client portal provides our clients with total transparency into the services we provide on their behalf and allow for better management of the credentialing process. For more information about our services, complete our information request form here and a representative will contact you.